This is the cover of a chapbook I recently made for my friend Julie Haught. I have been feeling a great need, lately, to gather some of the haiku and haibun I’ve been writing into one place. The task was made much more pleasant by the thought of sending the collection along to someone who has taken care of me for many years and in so many ways. The letter I sent along with the chapbook is below. I am typing this while listening to David Bowie’s “Space Oddity.” I have iTunes on my computer and often listen to music while I write. I am sending you something I’ve wanted to make for you for a long time. I could send you links to where you could find the works in this chapbook online, but that just seemed like an imposition. I call this chapbook Little Works. This title has a double meaning that I think you can appreciate. I don’t wish to explain any of the pieces, only a little bit about how I came to write them. I’m listening now to “Heart of Gold” by Neil Young, which seems appropriate to this conversation. As you know, I started a haiku project a while back. To date, I’ve written a little over 330. Most of them, I now realize, aren’t really haiku, and some of the ones that are haiku aren’t very good ones. In fact, out of all the ones I had written, I could only a find a few that I thought good enough to put into the chapbook: 66, 204, 234, 239, 262, 275, 276, 281, 278, 310, 311, and 313. I’m not discouraged. After finishing your chapbook, I wrote several more haiku, and I think they are getting better. I plan to continue the haiku project and, hopefully, make more of these little chapbooks for my own entertainment and to give to friends. I’ve also included some of the haibun that have recently been published online. You were asking about haibun in one of your letters to me, and I thought the best way to answer you was to show you some of mine. I think you must have run across Basho’s Narrow Road to the Interior at some point. It’s Basho who perfected haibun and continues to serve as an early model for everyone attempting haibun. Playing in iTunes now is Man on the Moon by REM. Do you know REM? You will remember that Basho wrote of how the sun and the moon are eternal travelers: “Even the years wander on. A lifetime adrift in a boat, or in old age leading a tired horse into the years.” Writing those lines, I can remember standing in Thackeray’s Bookstore many years ago and reading them. It was my introduction to Basho. I put him away for a long time while I struggled with writing the novel. I picked him up again in 2002 or 2003. Subsequently, I began reading more and more about the Chinese and Japanese poets, and pretty soon I understood that I needed to integrate my life and writing in a similar way that they had. I was deeply moved by the works of Ryokan whom I’ve quoted in Little Works. I’ve written several pieces based on my readings of his work. I felt a great need to bring some of these things I’ve been writing lately into one place. Julie, you were the only one I thought of to be the recipient. The chapbook cover is from a haibun journal of mine. 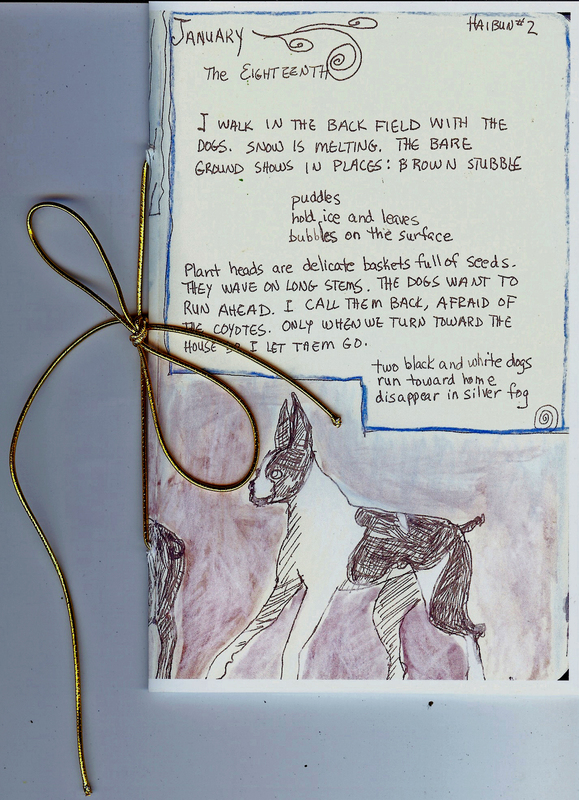 My first haibun were written last January after going for a walk in our field with the dogs. I did the artwork the same day. I scanned the artwork and printed it on a notecard. Don’t you just love it when high and low tech come together? I used the computer and printer to put the image on the front of this card, and I’m typing this with and [sic] old Olympia manual typewriter. The airstream in the picture is where I am right now. We live on 12-acres, and this trailer is in our field. I use it as a sanctuary, a place to be fully alone. Right now, our field is white, filled with Queen Anne’s Lace. 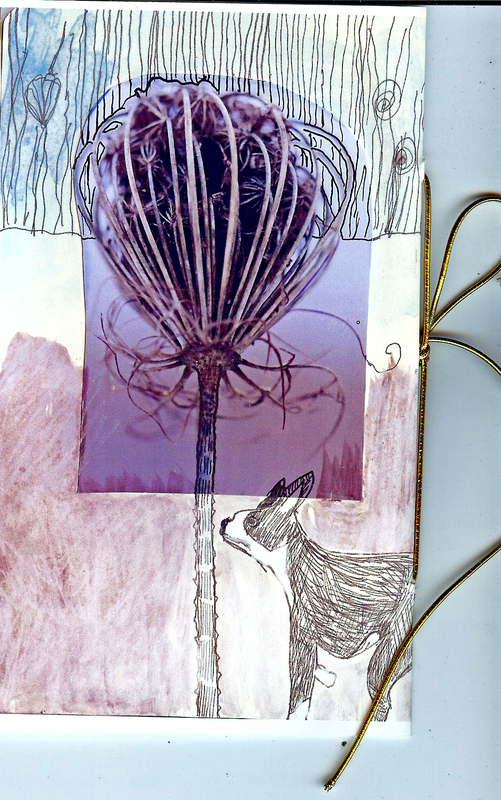 In not too long, the thistle will bloom and the field will be riotous with purples. Allen and I think of you often. I enjoy your Facebook posts; they do keep me close to the Western sensibility. Thanks for that. Thanks, too, for acknowledging some of my [Facebook] notes, the poems and the haiku. It has taken me a long time to find a writing regime that keeps me connecfted to my writing life on a daily basis. I was never good at keeping a diary, but the haiku and haibun are right for me. I am trying to write at least 100 haiku a year. That’s really not very impressive. I was reading last night that people in haiku clubs in Japan write that many in one weekend gathering. I haven’t yet worn my Mother Mary belt buckle. It has been so stinking hot here that it isn’t any fun to dress up. Plus the air conditioner went out on our truck, making the situation all the worse. Autumns here are cool and crisp, so I plan to wear it then. Have you found a way yet to put your life story into words? Do you like where you live? Do you sometimes find it hard to stay creative? There was a time with [sic] both Allen and I did a lot of art. I still do a few things, but not nearly as much as I’d like. Allen was very inspired in Santa Fe and talked of returning to woodwork. But it can be hard to hold onto inspiration when your home seems dreary in comparison to places you have been. Strangely, I seem to write more haiku at home than on trips. YOu’d think it would be the other way around, but I’m more active when we travel and here, at home, I think I use the haiku to keep me admusted to my situation in life. In other words, it is a kind of salvation. Out West, very often, I feel like I’m already saved. These are things I’m just now starting to figure out. I know you are busy, but try to write to us sometime. In this introductory letter to Emma Garland, I address how place influences creativity and how change can sometimes feed it. This is part of the 13 Women Online project, initiated by Lee Janine on Facebook. Lee sent a message to twelve women proclaiming that if we were in a room together, we could change the world. Counting Lee, that makes 13 women. I love the idea that 13 women could effect change. Today I opened a FB message from Lee addressed to twelve women in her life that she cherishes. She said that if the twelve of us (thirteen including Lee) were in the same room that anything would be possible. And I started wondering what might happen if we could be in the same room, if only a virtual room. Trickster is my favorite mythological character. He (Trickster is usually male) keeps life from getting stale. He usually stirs up one hell of a mess. I’ve been through a lot of these Trickster-induced messes, and they are no fun, believe me, but I usually come out on the other side transformed. My husband and I recently spent quite a few weeks out West. We spent most of our time in Santa Fe. Since returning, I’ve been thinking that my life has sunk into a predictable groove. I think Lee’s message struck home for me because she spoke of possibility. Homecoming has been hard. I keep thinking about the West. I want to put on my cowboy boots and kick up the dust. I want to feel alive like I did in Santa Fe. Everywhere in Santa Fe are images of Our Lady of Guadalupe. Although I’m not Catholic, I’m drawn to images of her. It’s not so much that I crave her love and protection but her numinous quality. She burns with the glory of the sun. I want to be on fire like that. Recently, Lee Janine sent a Facebook message to twelve women she has met online. I was one of the recipients of the message. What struck me most about the message was Lee’s comment that if all of these women were in the same room, they could change the world. We subsequently decided to send some snail mail to each other, to see what magic might happen. This is Lee’s letter to Shanti Perez. It’s about life and art and making the world a better place. Lee Janine: I’m a teacher and artist, currently living in Colorado. I’m most inspired by people who are positive, friendly, and creative – despite challenges they experience. I believe wise people learn patience, flexibility, and how to enjoy simple pleasures in life. Dreams include becoming a teacher, keeping healthy, and growing old with friends and family around me. I love life, though I think it takes courage to live. I’m working on my courage. This is a wonderfully happy time in my life! On Oct. 12, I’ll be turning 34 and I finally feel like I’ve learned to relax into life. In the past I had so much fear, feeling anxious about time and how quickly it passes. Now, I’m floating along, collecting memories… I feel a new sense of freedom. I once read that if artists took their creativity and applied it to their lives, the world would be a much better place. I agree with that philosophy. It’s sort-of like the old saying, you have to love yourself before you can love anyone else. I want to create more love in the world, so I have to create love for the world everyday and accept what life is. I have to give up some control. Life is a creative challenge, but it’s the most rewarding one to undertake!